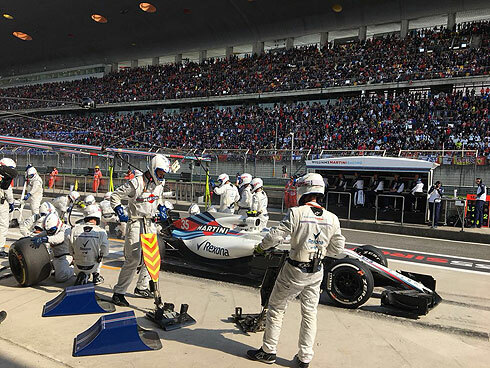 The 2018 Chinese GP would see another difficult race for the Williams Martini team. 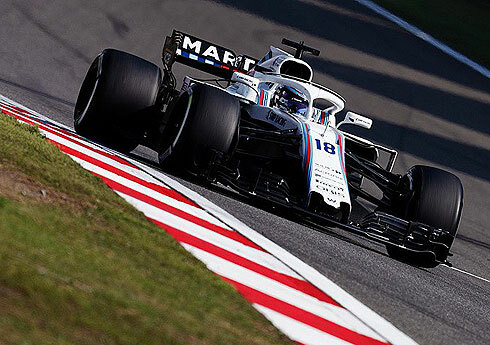 Both drivers would make good starts to the race with Lance Stroll moving into the top ten and Sergey Sirotkin just outside but as the race progressed both were again hampered by the lack of pace from the FW41. They would both drop down the order finishing in 14th and 15th with Lance finishing ahead of Sergey. A difficult race but one that had the feeling that the team is making small steps forward. 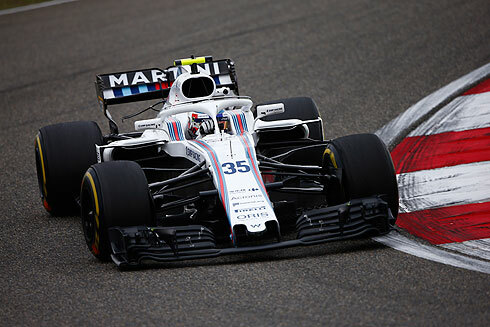 The 2018 Chinese Grand Prix would see the Williams Martini team with their two drivers starting from 16th and 18th with Sergey Sirotkin leading team-mate Lance Stroll. On pole was Vettel followed by Raikkonen, Bottas and Hamilton with these drivers all starting on the soft tyre. Verstappen was 5th followed by Ricciardo, Hulkenberg, Perez, Sainz, and Grosjean 10th. This group of drivers would start on the ultrasoft tyre. For Williams both drivers were starting on new soft tyres. Outside the top ten everyone except for Hartley and Gasly were on soft tyres. The Torro Rosso cars were on medium and ultrasoft tyres running split strategy. The grid would move off and complete their formation lap and would from up. With the start lights going out it would be Vettel leading with Bottas moving into second. Raikkonen was third from Verstappen and Hamilton. Verstappen would pass Raikkonen for third using his ultrasoft tyres. 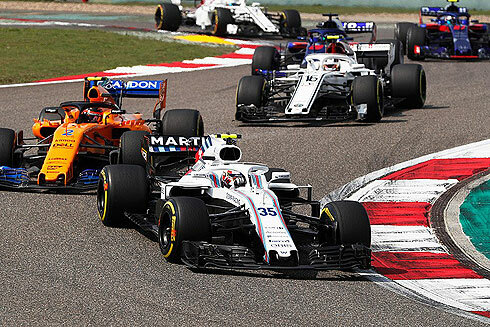 The start for Williams would see Lance running in 14th and Sergey 16th. Lance was able to move up to twelfth. Hamilton was now 5th followed by Ricciardo, Hulkenberg, Sainz, Grosjean, Magnussen, Alonso and Lance 12th. Sergey was right behind Perez but would fall away as they completed four laps. Sergey was now under attack from Vandoorne while Lance had Ocon right behind. At the front Vettel was now leading Bottas by 2.2 seconds with a similar gap back to Verstappen. Ocon would finally get past Lance seeing the Williams driver drop to 13th. Sergey would also be passed by Vandoorne to be 16th. Lance was now been attacked by Perez who had lost places at the start. The gaps in the top ten meant that everyone was running quite separate races with ten laps completed. Vettel and Bottas were so much quicker than those behind with Bottas now 4.5 seconds ahead of Verstappen. Both Williams drivers were having fairly lonely drives with gaps to those in front and behind. Ocon would pit on lap thirteen seeing Lance move up to 12th and Sergey 15th. Sainz would pit seeing Lance move up to 11th and Sergey 13th. Hulkenberg would also pit seeing Lance and Sergey moving forward one place to be 10th and 12th but they had yet to make their first stop. Grosjean would pit on lap eighteen seeing lance now ninth and Sergey 12th. Both Verstappen and Ricciardo would come in on the same lap taking on the medium tyre. Hulkenberg would pass Sergey for 11th seeing Sergey now 12th. Vandoorne was right behind Lance as Bottas pitted on lap twenty one coming back out in third and ahead of Verstappen. Vettel would pit on lap twenty two coming out into third behind Bottas with the undercut working for the Mercedes driver. Raikkonen was now leading but had yet to pit. For Williams lance was still 9th while Sergey was 13th. But Lance would be passed by Lance seeing him drop to 10th. Sergey would move up to 12th while Lance would pit on lap twenty five dropping to 17th now on the medium tyre. Bottas was closing on onto Raikkonen as Sergey dropped to 14th having been passed. Bottas would pass Raikkonen to take the lead while Vettel would get past his team-mate. Vettel was close behind Bottas as Raikkonen pitted coming out in sixth. Lance was able to get past Ericsson for 16th as Sergey finally pitted coming back out in 19th running on the medium tyre. This would see Lance move up to 15th. The two Torro Rosso cars would make contact seeing debris out on the track at Turn 14 and seeing the Safety Car been deployed. This would see Verstappen and Ricciardo both pit joined by both Renaults and Ocon. The order was now Bottas, Vettel, Hamilton, Verstappen, Raikkonen, Ricciardo, Magnussen, Hulkenberg, Grosjean and Perez in tenth. Perez would also pit dropping to 13th. The Williams drivers were now running in 14th and 16th. The top three were all on older tyre but Verstappen was now on new soft tyres. Team-mate Ricciardo was also on new soft tyres. Sergey would also pit taking on new soft tyres seeing him 17th. The Safety Car would come in and the race would restart with Bottas leading fro Vettel and Hamilton. Lance would drop to 15th after making a poor restart and Sergey was still 17th. Ricciardo was able to pass Raikkonen for fifth. Gasly was given a ten second penalty for causing a collision with his team-mate. Verstappen would try and pass Hamilton but would run wide seeing Ricciardo get past dropping to 5th. Ricciardo was now right behind Hamilton and would pass him taking third. With fifteen laps remaining and Ricciardo was closing on onto Vettel. Verstappen would pass Hamilton for fourth while the Williams drivers were still 15th and 17th. Ricciardo would pass Vettel easily and now set his sights on the lead. But it would all go wrong for Verstappen would make contact with Vettel seeing the pair run wide. This would see Raikkonen now third followed by Hamilton and Verstappen. Hulkenberg was now sixth and Vettel seventh. Lap forty six and Ricciardo would pass Bottas to take the lead and would drop away from the Red Bull. Verstappen would be given a ten second penalty for causing a collision. late in the race Grosjean would pit seeing Lance and Sergey move into 14th and 16th. Verstappen would pass Hamilton for fourth but he did have his penalty to add in. The order was now Ricciardo, Bottas, Raikkonen, Verstappen, Hamilton, Hulkenberg, Vettel, Alonso, Sainz and Magnussen in tenth. Hartley was out of the race retiring in the pits. Both Williams drivers were running in fairly lonely positions but Alonso would pass Vettel for seventh. The final laps of the race would wind down and it would be Ricciardo who was able to take victory from Bottas and Raikkonen. Hamilton was fourth with Verstappen taking his a ten second penalty to be fifth. Sixth was Hulkenberg followed by Alonso, Vettel, Sainz and Magnussen in tenth. For the Williams team their drivers would finish in 14th and 15th. 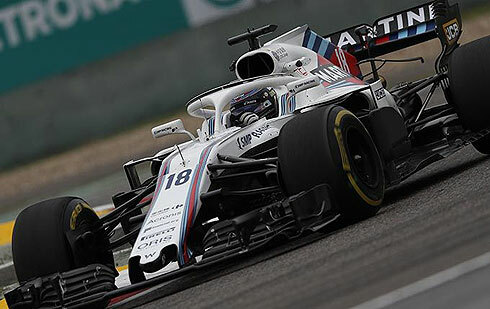 having made really impressive starts, in particular with Lance making up several positions, but they were again hampered by the lack of pace from the FW41. Still to have both drivers finish the race even if down the order was still a really positive way to end the weekend.